I will be teaching and introduction to Tellington TTouch Training sunday april 30 at ten am. This will be a great opportunity to learn abotu this amazing way of working with all animals. Cost for the worksghop is 50.00. Please call to register as we only have room for 6 dogs and handlers. Observers also welcome for an auditing spot which will cost 30.00. What is TTouch and how can it help your dog? TTouch - the Tellington TTouch® - is a method based on circular movements of the fingers and hands all over the body. The intent of the TTouch is to activate the function of the cells and awaken cellular intelligence - a little like "turning on the electric lights of the body." Tellington TTouch will help your dog learn to relax and gain more confidence. This class is by appointment only. Dennis Fehling is available for private and group trainings. The TTouch is done on the entire body, and each circular TTouch is complete within itself. Therefore it is not necessary to understand anatomy to be successful in speeding up the healing of injuries or ailments, or changing undesirable habits or behaviour. 1 The first part is the touches themselves. 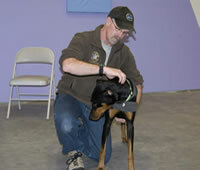 The touches help to being awareness to the body and also help to strengthen the bond between human and animal. One thing that TTouch is not is Massage; we concentrate on moving the skin and not the muscle. 2 The second part is the equipment we use in TTouch. We use various leash configurations to help with dogs that pull and to help bring the dog back in balance, harnesses that reduce pulling and take the pressure off the dog’s neck. We use body wraps for anxiety, thunderstorms, fireworks. The wraps also help the dog to feel comfortable in their own skin. 3 The third part is the movement exercises in the playground of higher learning. The playground is great for teaching focus, leash skills, problem solving for both handler and dog. This is such an important component of TTouch for building confidence as well as body awareness. 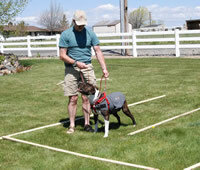 The dog and handler move through different obstacles challenging both mind and body. 4 This part is about the vision you have for your dog and how you see your dog in the future. Do you see your dog, happy, confident, aware and ready to take on life’s challenges? I believe the way we see our dogs is exactly the way they are and will be.